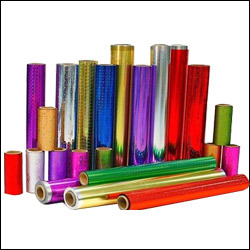 Lacquered metallised Films available in thickness 12 micron and above. Gloss and Matte Finish. Available in Silver, Gold and Colours with Plain or Holographic effect. Decorative labels, textile industry, Yarn and Sequins. Single/ Double side coated.